The calibratable platform scale is a solid calibratable platform scale that is reasonably priced. The calibration of the platform scale is performed by calibrating authorities following the calibration directives of Class M III. The solid fundament of the calibratable platform scale is made of lacquered steel and features a plastic-coated platform made of steel. The calibratable platform scale has also pedestals that can be alternated in their height, assuring a firm stand. The navigation display of the platform scale is placed on a stand mounted within a reachable height and fixed to the platform scale. In order to assure an ideal readability of the display at all time, the display can be alternated in its angle. Functions, that the calibratable platform scale features, are: automatic tare, item counter, saving tare value, gross / net weighing, percentage calculation, threshold weighing etc. 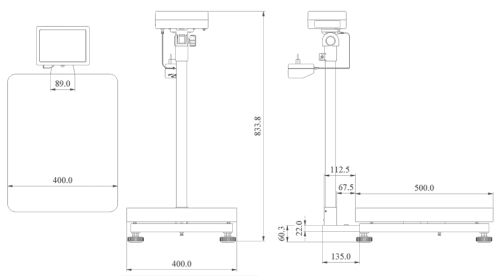 Further characteristic of the calibratable platform scale are: e.g. analogue output 4 ... 20 mA or 0 ... 10 V, RS-485, LAN interfaces, potential-free contact, USB data storage, scanner input etc. There is also an edition of this platform scale without the stand purchasable, which you will find here. If there are any questions about this calibratable platform scale PCE-SD C series, please have a look at the technical specification below or call: UK customers +44(0) 23 809 870 30 / US customers +1-410-387-7703.. Our engineers and technicians will gladly advise you regarding the platform scales or any other products in terms of regulation and control, or scales and balances of PCE Instruments. * the minimal load is defined here as the load, above which the calibration authorities test their accuracy. The calibratable scale shows even lower weights, but these are not allowed to be used for custody transfer. Here you can see the diameters of the calibratable platform scale PCE-SD C series, where the size of the platform measures 400 x 500 mm. Further diamaters. For customers, who want to admit the device to their internal pool of test equipment. The calibration procedure includes laboratory calibration process and ISO certification. These certificates are comparable to NIST and UKAS certificates. They are accepted all over the world. The 16 bit analogue output converts the weight value into a mA or V signal, so that e.g. a SPS control system can response to that. Example with 4 ... 20 mA: At 0 kg a signal of 4 mA is sent, while at maximum load a 20 mA signal is released. The 20 mA / 10 V limit can be also customized individually. This contactor is called in short-terms an OC-contactor. It means that by reaching preset weight limits e.g. 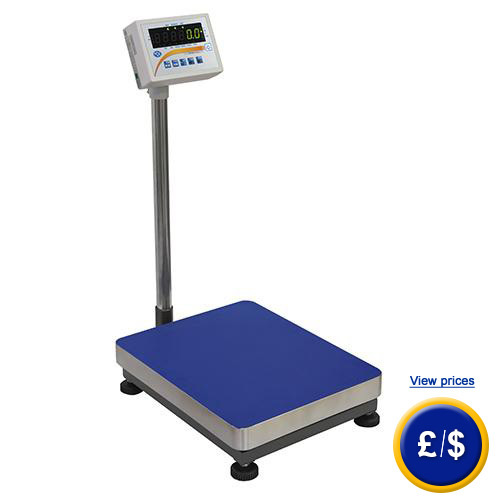 MIN / OK / MAX, the scale is able to switch a maximum of three contacts. The switch can be either set as an impulse or a continuous signal. The modular scale gets its own IP address, which can be accessed by any computer inside the network, so that there is no requirement for a computer in reachable distance. A simple and wireless connection can be also established via the WiFi-interface which makes the calibratable platform scale with its own IP address network-compatible. We offer to replace the RS-232 interface of the calibratable platform scale by a RS-485 interface for extra charge. This is a 6 V / 4.5 Ah Lead acid battery which is to put into the battery compartment at the bottom of the scale. The battery can be also put in subsequently. It will be charged by the calibratable platform scale. Operation time: see technical specifications. For immediate print-out of values from calibratable platform scale (e.g. for protocol of weighing data). Delivery of printer incl. RS232 printer cable and 240 V network adapter, paper width 112 mm ( 1 role incl.). This signal lamp helps assuring a visible signal system for the whole personnel. If the weight is below the minimal limit, the yellow lamp brightens up, if the values are within the preset thresholds, the green lamp brightens, if the weight trespasses the upper limit, the red light starts brighten. This serial cable has a total length of 1 m, and features the accordant pins 2-3/ 3-2 / 5-5 for a bi-directional communication path of the calibratable platform scale with a computer. This adapter is meant for a conversion from a RS-232 interface Sub D 9 to a USB interface. It additionally requires a serial cable with the right poling.